The 11th St. Precinct Bar & Grill won an award for best tenderloin in the Quad Cities a couple years ago. The newspaper running the competition included grilled and breaded tenderloins from all parts of the Quad Cities area. There is a large golden pig trophy wedged between two flatscreen televisions behind the bar area marking their triumph. Location: 2108 East 11th St on the intersection with Mound St in Davenport, Quad Cities, Eastern Iowa. Directions: This is technically in East Davenport a small commercial area of renovated historic buildings just off the River Road between Davenport and Bettendorf. 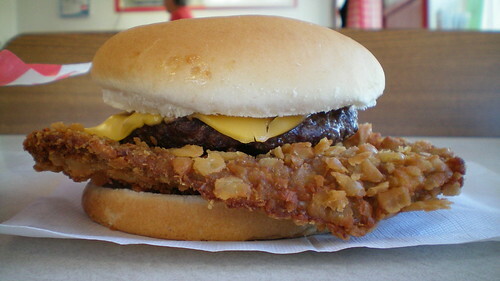 The Tenderloin: Listed on the menu as the "famous" half pound jumbo grilled tenderloin. The first thing that sticks out is the great color on this grilled loin. The alternating white of the pork loin meat checkered with the grill marks and seared edges. It has a great charred surface with just a bit of seasonings added during the grilling process. The texture of the pork loin is firm on the outside but chewy in texture, just the right amount of time on the hot grill. Served on a buttered and toasted bun. This is the best grilled loin I've eaten so far. Price: $8.50 with a side. Also on the menu: The grilled tenderloin is the star of the menu with its own section, its local awards are highlighted on the menu and other graphics There are other choices like specialty pizzas, pasta, burgers and bar food fried appetizers. "The Big Kahuna" Spicy Pepperjack Bacon Tenderloin: Fitting for a sandwich with seven words in the title, this had layers of Hoagie Roll, Grilled Pork Loin, Pepperjack Cheese, Bacon, Spicy Giardiniera dressing, lettuce, onions, tomato, and lettuce. The star of the sandwich is the sliced grilled pork loin. The Spicy Giadiniera with peppers packs an acidic and spicy punch that you just don't find in most sandwiches in Iowa. I would love to say that this sandwich is some meaningful meeting of Iowa and Chicage style sandwiches, but its more of just a combination of ingredients that kinda works together. Price: $9.75 with a side for lunch. Service: I just sat at the bar and the bartender took care of my order and made conversation with some of the regulars. Ambiance: This has been a bar and grill for decades but was renovated recently with modern fixtures and flat screen televisions. There is a bar area and seating space, big windows facing the street and an area for live bands on weekends. Final Thoughts: The online reviews of the 11th St Precinct seem to have a few things in common. The new renovation is just like every other new bar built anywhere, and the grilled tenderloin is the tastiest sandwich of its kind by any estimation. There are other grilled tenderloins in the Quad Cities area, but driving across one of the bridges into Illinois is not on my list of things to do. I will eventually get around to stopping by The Filling Station in Davenport and TC's Point After in Dewitt to try their breaded tenderloins sooner or later. I had known about this tiny cafe on Main St. in Madrid for years but hadn't made it in during business hours until recently. Nothing compares to the wide boulevards and historic architecture of the European capital cities and their eponymous Iowa small town counterparts. The Town and Country Cafe closes at two and does not accept credit cards, so don't show up in the afternoon without cash and expect to find anything. Location: 213 W 2nd St in Madrid, Boone County in Central Iowa. Directions: 2nd St is the old business district just off the main drag through town. The Tenderloin: This was a big oval of pork meat between a bun. The cut of pork loin was thin with just a minimum of juiciness. The breading had some good crunch, but this didn't take away from parts being just too thin. Served with your choice of fixings on an untoasted bun. Overall 7.1 out of ten. Price: $4.50 for lunch with a side of ruffled potato chips. Also on the menu: The menu is simple, with basic sandwiches for lunch and breakfast in the mornings. The Saturday special is homemade Biscuits & Gravy, other daily specials are available for lunch. The place had run out of pies when I stopped in at about 1:30 in the afternoon. Service: There were four old ladies running the show and they seemed to recognize every person in the room by name. Ambiance: There is an old counter and some booths for seating. This is a no frills place with pictures of the High Trestle bridge and drawings of Gingerbread Men on the walls. Final Thoughts: The Saturday morning special of Biscuits and gravy might be a good reason to make it back here. I am slowly getting around to writiing up the places I've stopped at while driving down Highway 210 just north and west of Des Moines. I was at Cole's Ice Cream in the Fall, and I will stop at Lou's Diner in Woodward next.